It took me a while to memorize the nickname given to me by our Chinese interns. Last night I could finally remember the pronunciation and looked it up on the internet. They call me Bart Fēixíngyuán! Thank you Cecily mèimei and Christy mèimei! Today was a rainy day. Yes, it also rains in Fujian. The big difference compared to home is the outside temperature remaining high even during rain. Actually, a big difference, you just get wet without feeling chilly. Getting out was not the plan anyway, so time in the morning to put some work on the presentation for tomorrow. We agreed with the team to go and visit during the day the local hot springs and pools. Multiple small hot springs, going from cold to very hot, and one fish bowl to sit in with little fish sucking on your skin. I tried a few hot springs but moved quickly to the large 50 pool. The pool itself looks like an industrial steel construction covering the large pool. Along the pool people sitting at small tables, playing cards, smoking cigarettes, and making their own tea. I was quite strange for me. I jumped in but was thrown out, swimming cap was mandatory. Luckily the local shop could provide me one. Back to the pool I got a lane all for myself. Being the only foreigner in the pool, seems all Chinese avoided swimming into my private lane. I could swim relaxed and was supervised closely by several safety guards. I completed 34 laps until Alia came to remind me that time was up and we had to leave, jumping back on the bus to the hotel. It was a nice stretch and a good idea to take a break. This is our second weekend in Xiamen. 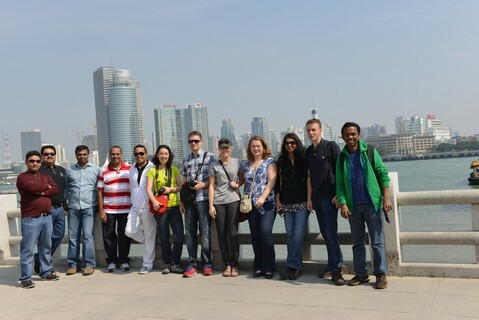 We agreed going with the team to Quanzhou and experience the local culture for a day. We put together some of our own money and hired a small bus. The driver was actually familiar with the village; he took us around very efficiently. We went the Kaiyuan Temple, experienced the typical local food, moved towards the Qinqjing Mosque, the Confucius Temple, a small museum on the maritime history of the village, and a small museum on the Islamic history of the village. Going back and forward to the village, hanging around at all these places made it a long day, and gave many opportunities to discuss among the team. During the ride I learned the different pronunciations of the word ‘shi’ … Mandarin is not going to be easy. I keep this blog post short, I have some work to do, must be prepared for next Monday! Enjoy watching the pictures. Safety first on a busy road? The other day the press was present at the official opening ceremony. 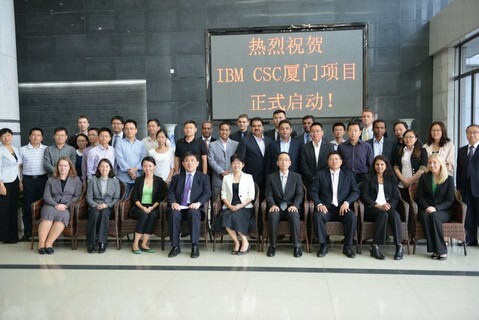 Today we got the newspaper; we made it up to the top of the front page with an article describing what we are doing as IBM with the CSC project in Xiamen. Not sure about the details, but anyway it is looking very nice! After the team meeting we quickly agreed on the weekend program. We planned to go on Saturday going to the village of Quanzhou, We asked our interns to hire a bus and to negotiate a lower rate. They did a great job! I needed some clothes and had to fix this before having a joined dinner. So, I asked Leonore to write down the name, address, and driving directions of a local shopping down in mandarin on a piece of paper. Mukund and Sabarinath joined the ride with a taxi. 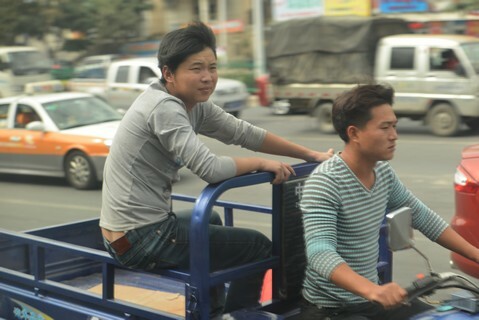 We crossed the village of Xiamen and picked up quickly the stuff we needed. We jumped back into another taxi and I gave the driver the instructions given by the hotel. For some reason the driver didn't get it, either he couldn't read or didn't know where the hotel was. The nearest point to the hotel that came into my mind was the island Gu Lang Yu. I just mentioned 'Gu Lang Yu ferry' and he started to smile; he kept talking to us in Mandarin, and joined the crowded traffic. I started driving in the right direction, which made me confident he got it. Back at the hotel I dropped my stuff into the room and joined the dinner we offered as a team to our inters, in particular two of them having their birthday! A bit exhausted dropped into my bed, so many things to do before having our next meeting on Monday. Being with IBM, we will find a way to get this done. Although I had a good sleep I woke up with some headache. The good news is that I found a torch installed next to the bed, which you might need in case of a power-cut. In my case a bit late, but anyway it is good to know. It is hard to believe that I’m away from home since more then a week. Time is flying fast. But it still looks a long time till I am going to be back at home. 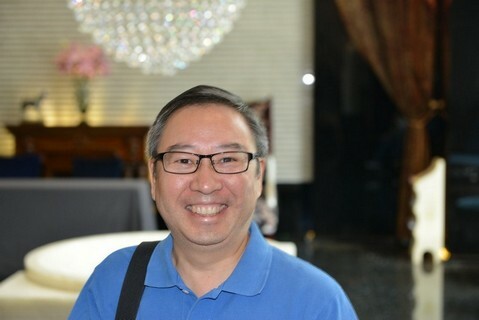 Feeling a bit dizzy, I couldn’t eat much at breakfast and took only some of the fresh fruit. Have the feeling I might need to step back in some kind of safety mode in terms of food. After breakfast Amit, Megan, and me walked down the street to go and work on the top floor of Starbucks, of course with a large Americano. We had to prepare the lecture for the local school as we have to submit the outline by the end of the day to the dean. I couldn’t really focus on what I was doing, and felt bad for my team mates at the end. Also a pity Cecily and Christy did not join the preparation work, they could have learned something. For lunch a small sandwich was more then enough. We drafted the first half of the presentation and returned to the hotel, where we had to meet the other team and work jointly on the second half of the presentation. At lot of discussion on the format, and finally we called our program manager Lesley to pass by and help us out in the interpretation of what needed to be completed by the end of the day. Lesley gave to Megan and me already a brief introduction in the art of Tai Chi during yesterday’s meeting pause. We could convince her to give us another introduction, which was great! We kept discussing, but we agreed to meet with the rest of the team downstairs at 18:30, so we had to break-up the gathering. We need to find a way to speed up the work, let’s see tomorrow how we can fix this. Downstairs we discussed briefly the possibilities of the weekend program. Seems many different opinions on the different alternatives is going the split the group apart. Again a very late night being busy with the preparation work. I got into my bed around 01:00 and when switching of the light next to my bed got a power-cut with a smell. Seems the switch burned and caused a power cut. I unplugged the lamp in the dark and went to bed, too late and too dark to get this fixed. This morning I could find the switchboard in my room with the daylight entering through the window. Indeed, the switch of the lamp seems in a bad condition. As for the past days I received a newspaper. 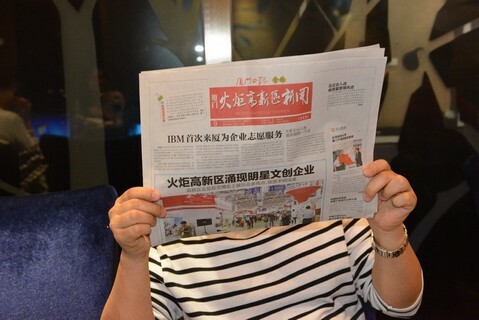 It is very attentive of the hotel staff to provide me with a daily newspaper, it keeps me informed about what is going on in the world and I remind me to the current date. 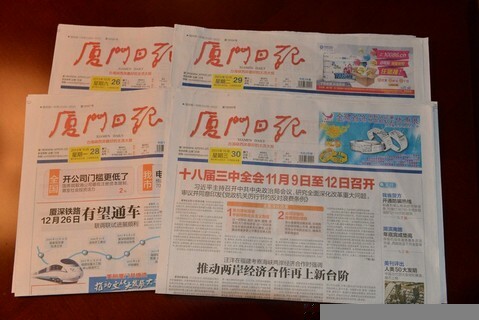 The whole newspaper sounds a bit Chinese to me, but it is interesting to go through it and to try figuring out what they are writing about. Duly on time we were picked-up for the meeting at the Lizhou customer, an important manufacturer of springs in China. At their facilities we gathered with the general manager and the management team. The meeting was very interesting and very interactive. We learned many things about their company, their concerns, and the advice they are looking for. These go in multiple directions, going from corporate strategy, marketing, sales, customer service, human resources, etc. We worked very late last night, and completed the preparation work for today’s meeting. That gave me a good feeling in the morning when leaving the hotel, thank you very much team to get this done! We knew already upfront several things about the company we were going to meet, but we drafted an agenda for the day, rephrased the expectations, and included a high level planning for the next steps. We were picked up at the entrance of the hotel by the local driver. Upon arrival we gathered with the general manager and his core team. I had a pretty good feeling during the meeting, which was conducted in an open manner, many interactions, and enthusiasm from everybody. I’m glad we did the preparation. I had the impression that our interns had a hard time with the translations. Every conversation needed to be translated, in both directions, with the additional challenge of using a difficult IT vocabulary. Think they enjoyed it, and they did a great job! We had a short joined lunch, where they were surprised to see me eating using chopsticks with easiness. After lunch we could use their facilities to discuss our findings and to prepare the next steps. We returned to the hotel around 16:00 and gathered back into my room to prepare tomorrow’s meeting, and to start the preparation work for the lectures at the college, all this took us to almost till dinner. We had a simple dinner, around the corner in a small place. I was happy to return early to the hotel, giving me some time to catch up with sorting out pictures, updating the blog … start to think about some shopping … finally, start to draft a plan for the weekend. The kick-off day was a long day. In the morning we gathered with the team in the hotel to prepare the afternoon official kick-off event. We ran through the agenda, making sure it would all go smoothly. Jasmine (梁伟娜) in charge of Corporate Citizenship & Corporate Affairs at IBM in China came over from Beijing and joined the preparation session. We all looked forward to it; in particular it will be a first encounter with the local community and local people we will work with. Interesting point that came out of the preparation session is the fact that the CSC program runs a bit differently in China compared to other countries. 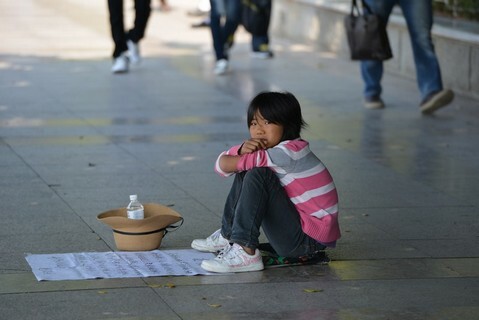 Most NGO are not represented in China, therefore IBM and DOT have chosen a smart way to help the local communities by addressing the needs of education institutes, local municipalities, and small companies. During lunchtime I was in desperate need of a large coffee. We saw during the weekend a Starbucks coffee shop in walking distance, it was the right moment to go there and get a caffeine upgrade. Tasting the 16 Oz Americano was great! At 14:00 we arrived at the High Tech campus of Xiamen for the kick-off event. After the mandatory photo session at the entrance we moved into the boardroom, core team and the host around the table, the interns doing the translations behind us, and the local municipalities and companies at the opposite side. All presentations and introductions go interpreted from English into Chinese and visa versa. I was a bit confused to see my photo projected surrounded by all these Chinese characters. After the meeting we sat together with the local partners to address the logistics for the following days, and with the local education institute we agreed on the high level content of the lectures. The event was concluded with a small team dinner. Good morning Xiamen! I had a wonderful night! Okay, I cheated a bit as I took Melatonin to get rid of the jetlag by avoiding getting awake during the night. I woke up at what I thought was 07:30, time enough for a nice shower and to prepare relaxed. Half an hour later I watched my watch and saw 09:00. Help, still get to find some breakfast and we should meet at 09:30. I turned out that my cellphone screwed up by changing from summertime to wintertime, which is not done in China. Finally, I made it to meet in the lobby at 09:30. Today is a special day, it was Megan her birthday! We met our two missing team members Vani and Shrikant! 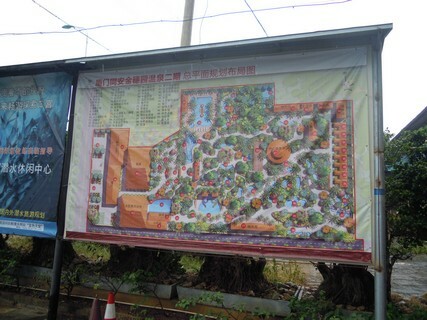 The planned activity for the day is a visit to ‘Gu Lang Yu’, an island in front Xiamen. We took the ferry to get there and walked around till lunchtime. Most people preferred to go for a beer and lunch, five of us went further to visit a monastery and climb to a small summit for a wonderful 360 degree view of the island. On our way back we stopped in some kind of tea house. Three different traditional green teas were served (all oolong tea). Before dinner we had time for a short stop in the hotel. I still had to get rid of the wrinkles in my suit. Having nothing to iron I had to use the shower trick. So I turned on the hot water and when the shower was filled with steam I hung op my suite. It’s a pretty cool trick which you might need to do two or three times, but it works. Last night Elizabeth and Megan jointly arrived, they both joined us during breakfast. Megan and I had already multiple discussions during the preparation work over chat as we are in the same subteam for two of the projects. Welcome Elizabeth and Megan to the team! We absorbed them both directly into our team. We enjoyed the local breakfast in the hotel, right after I walked with Michael and Ryan to the Carrefour supermarket to get a tray of water for the coming days. We decided to walk along the shoreline, with the intention to take the ferry to the small island in front of Xiamen. A long waiting line at the ferry terminal and a negative advice from DOT.org to go the small island in the morning made us changing our plans. We walk a long way along the shore, a great opportunity to discuss and to get known each other a bit better. Finally, getting a bit tired, we asked our interns to organize a bus for getting around in Xiamen instead of keep walking. After a few calls back and forward we got a bus organized departing from the hotel. Good morning! Breakfast is being served, my LFML comes as one of the first. This time potato with quinoa, orange juice, zero fat yoghourt, gluten free cookies, and to compensate a bit a butter croissant. All this, served with something called coffee, a grey-brown mixture of probably instant coffee with milk, which I kindly returned and exchanged for a black coke. We landed on schedule at Beijing international airport. The advantage of being with only a few foreigners on the flight turned into an advantage at immigration. The queues for foreigner were short, combined with a swift immigration check a nice experience. Luggage pickup is no difference to other airports ... wait, wait, wait ... seems a generic logistical problem of getting luggage faster from the plane to the luggage belt. Got my luggage, rechecked it for my connection flight to Xiamen. Let's hope it will arrive. Security at the airport is a bit messy and made me nervous, I was happy having this behind me. The domestic flight from Beijing to Xiamen was delayed and was full, me being the only non-Chinese! Again, right after boarding the stewardess came big a big smile to check with me in her best English my food preferences. It turned out a bit later that a low fat request resulted in scrambled eggs with scampi, a zero sugar cookie and two pieces of melon. I am learning quickly, seems low fat, gluten free, or no-sugar is all the same.